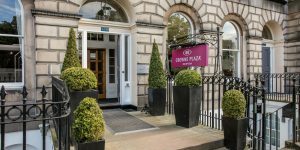 The elegant Crowne Plaza® Edinburgh – Royal Terrace hotel is about a 15-minute walk from Edinburgh Waverley railway station.Surrounded by sprawling gardens, the hotel sits on a quiet residential street on the edge of Edinburgh’s New Town. Edinburgh Bus Station is close at hand, and we’re a 25-minute taxi ride from Edinburgh Airport, as well as the financial district around George Street. You’ll be just a 20-minute walk from Edinburgh Castle. The National Museum of Scotland, the Palace of Holyroodhouse and the city’s main shopping streets are close by. Arthur’s Seat is 1.5 miles away. Matt is an Agile Coach and Trainer with 25 years of broad technology delivery experience with blue chip organisations in change management, product development, operational support models, IT strategy, cost justification and solution delivery.